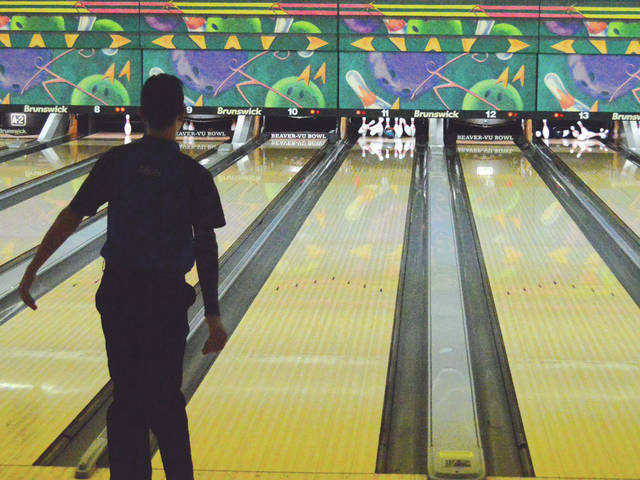 A member of the Xenia High boys varsity team rolls a strike during warmups prior to Thursday’s Jan. 24 match with Fairborn at Beaver-Vu Lanes in Beavercreek. Fairborn’s Audrey Renner follows her shot Jan. 24 at Beaver-Vu Lanes in Beavercreek. BEAVERCREEK — With division leads at stake in both matches, Greene County rivals Fairborn and Xenia battled in girls and boys varsity bowling action Jan. 24 at Beaver-Vu Bowl. And when the final pins fell, both teams left with division leaders. First, Fairborn’s girls varsity team claimed a hard-fought team win over Xenia. The Skyhawks held a slim 13-pin lead after the teams rolled their initial two individual games. Then the Fairborn girls tossed a 235 Baker game that was higher than any Baker game either of the boys teams could muster, to pull away to a 2,189 to 2,099 win. 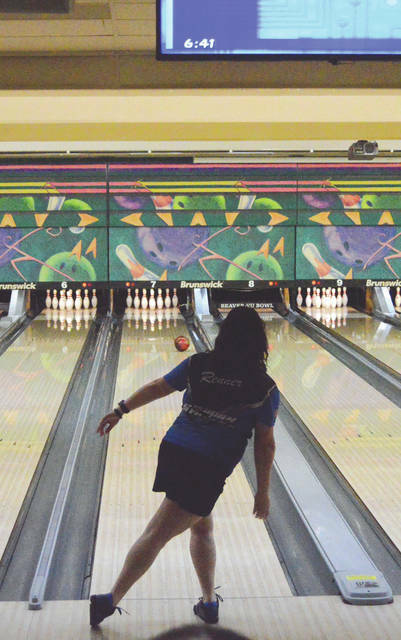 Callie Shimek led Fairborn’s girls with her 185-199 — 384 series. Natalie Hanson rolled a 178-195 — 373, Tessa Shearer rolled a 159-209 — 368 two-gamer, Audrey Renner finished with a 177-180 — 357, and Emily Reichert rounded out the girls scoring with a 156-145 — 301. “The girls team is really strong this season. They have a lot of talent, and I think they are just starting to realize that,” Fairborn coach Eric Mrenak said. With the girls win, the Skyhawks now lead the Greater Western Ohio Conference’s American South division with an 11-1 overall record, 9-1 in the division. Xenia’s girls, led by Kelsey Rose’s solid 184-237 — 421 series, with a 397 series from Kailee Palecek, 396 series from Caity Moody, plus series from Gillian Miller (333) and Gracie Howell (223) are now second in the GWOC South with a 9-3 overall mark, 8-2 within the division. In the boys battle, Xenia grabbed the divisional lead with a 2,355 to 2,008 win over Fairborn. Zane Eneix led the Buccaneers with his impressive 246-237 — 483 series. Samuel Bahorik rolled a 181-219 — 400 series, Aaron Adkins was next with a 222-176 — 398, and Cameron McPherson was right behind him with a 190-203 — 393 tally. James McDaniel contributed with a 175 second game, and a sub bowler turned in a 146 in the opening games. The Xenia boys are now atop the GWOC South. While both Fairborn and Xenia still have identical 7-5 records overall, Xenia took a one-game lead in the divisional race at 6-4 (to 5-5 for the Skyhawks). “The boys’ first two games were fantastic,” Bucs coach Robert Rose said. “The target for a great combined regular game score for the boys is 1,000. Our goal today was to shoot a 2,400, and we ended up at 2,355. That’s the fifth straight match where we’ve rolled a team score over 2,300, with one of those being a 2,435 (in a win over West Carrollton). Neither school has wrapped up a divisional crown just yet. Xenia and Fairborn will meet once again this season, a 4 p.m. battle on Monday, Feb. 11 at Fairborn’s Bowl 10. Xenia has a road trip to Columbus to compete in the Jaguar Baker Marathon, a 16-game Baker tournament which will be held starting at 11;30 a.m. Saturday Jan. 26 at Wayne Webb’s Columbus Bowl, the site of the annual OHSAA state bowling tournament. Meanwhile, Fairborn will get back into GWOC South action at 4:30 p.m Monday, Jan. 28 at Dayton’s Capri Lanes against Trotwood-Madison.